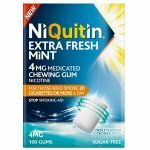 Nicotinell Gum 2mg is a nicotine replacement therapy (NRT). Nicotinell Gum 2mg is particularly useful for light smokers who are more likely to experience less severe withdrawal symptoms, and for those who have previously failed to stop smoking with nicotine replacement therapy. You've taken a positive step towards a smoke-free beginning, soft chewing Nicotinell gum comes in a range of unexpectedly bold flavours that are pleasant to chew throughout the day, Nicotinell can help you control the cravings that often occur as you try to achieve a smoke free life. 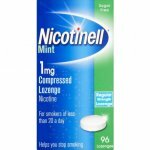 Heavier smokers who are more likely to experience severe withdrawal symptoms and for those who have previously failed to stop smoking with nicotine replacement therapy should use Nicotinell 4mg gum. Do not chew more than 1 piece of gum at a time and do not use more than 25 pieces of 2mg gum a day. As you chew, it releases nicotine to help ease your physical cravings and reduce your desire to smoke. To get maximum effectiveness from Nicotinell gum it's critical you follow a "chew and park" method for at least 30 minutes. Chewing the gum for a couple of minutes only without parking it, doesn't allow the gum to help provide relief from cravings. Repeat the process for up to 30 minutes. At the end of your 3-month program, reduce the amount of gum you use each day until you phase it out all together. If you smoke 20 or more cigarettes a day we recommend the 4mg gum. If you smoke less than 20 cigarettes a day try the 2mg gum. We suggest you use the gum for three months, chewing up to 10 of the extra strength 4mg gums or 20 of the regular strength 2mg gums per day as and when you experience cravings. Do not smoke or use any other nicotine product while using Nicotinell Chewing Gum. Do not smoke whilst using gum. No to be used by persons under 18 years of age without the advice of the doctor; if you are pregnant or breast feeding; if you have serious heart disease. If you are under the care of your doctor or taking prescribed medication, consult your doctor or pharmacist before using this product.